In Tasmania’s heaths, herbfields, cliffs, lake margins and among cushion plant communities of the Northwestern and Central highlands lurk one of Tasmania’s most elusive botanical secrets – a little lily that hails from a botanical lineage of great antiquity. First though, we must clarify what exactly is a lily. The natural history and taxonomic relationships within the large family of lilies (Liliaceae) often vexed botanists in the pre-molecular age. After botanists became well accustomed to assigning the appellation of ‘lily’ to a great many species of plants, the molecular blade swiftly and decisively ended the empire of the the lily family. Asparagus (Asparagus spp. ), the onions (Allium spp. ), the pineapple lilies (Astelia) etc., became allied to other plant Orders (as will be elaborated in another post!). Some of the remaining members of what was once the Liliaceae still remain in what is considered an Order of Lilies, the Liliales. However, the members of this once colossal lily family grouped into smaller families of their own. One family of lilies, the Campynemataceae, is of paramount interest. Molecular work based of the gene sequences of the RuBisCo enzyme (rbcL) that is present in the chloroplasts of all plants, tells us that the Campynemataceae lineage is the oldest among all that can still be considered a part of the great lily order. In 2004, researchers Thomas Janssen and Kårl Bremer compared the rbcL sequenc es of representatives of the families in the Lily Order and estimated the Campynemataceae lineage to have come into existence some 117 million years ago, as a sister group to all other families of the Lily Order. 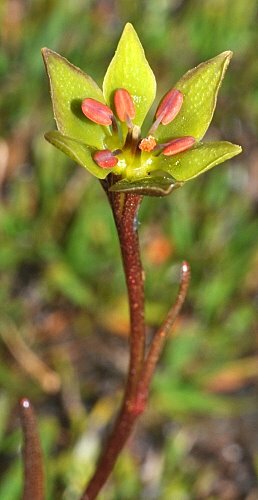 The lily I have deemed to be one of Tasmania’s most elusive botanical secret is Campynema lineare (Green Mountainlily), a representative of the Campynemataceae. 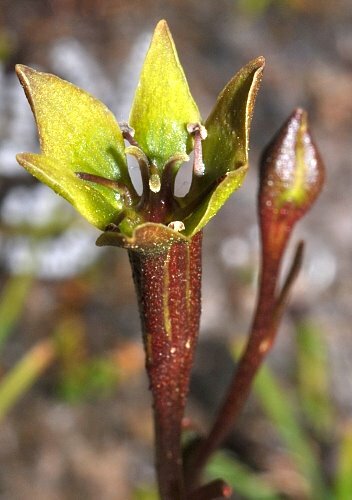 C. lineare is endemic to Tasmania and is the only species in its genus, and Campynema is one of the two genera in the family. The only other members of this family is a genus of three species, the Campynemanthe, that hails from New Caledonia. C. lineare is a slender herb up to almost half a meter in height, but usually much smaller in highland areas. The leaves are linear as the specific epithet ‘lineare‘ suggests’ but highly inconspicuous when the plant is not in flower. 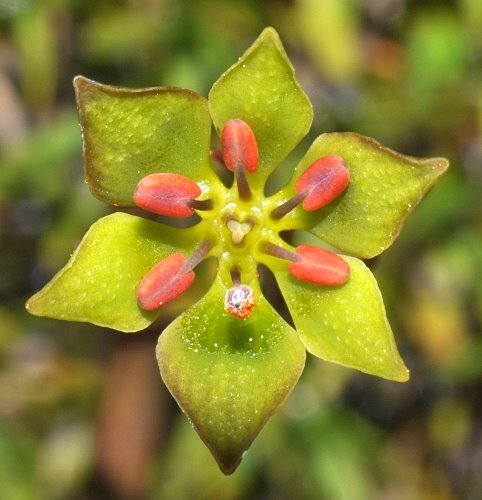 The blossoms are scarcely 2 cm across, with yellowish-greenish floral parts, borne on a brownish stem. This combination does not help in making it stand out well from the surround vegetation. Before releasing pollen however, the bright orange stamens do stand out quite clearly against the greenish floral parts, but in most other respects, C. lineare is a rather inconspicuous plant and not largely different from what anyone would call a ‘lily’. A casual observer would not have guessed that it is a relict of ancient lilies. Probably not even Jacques Labillardière, the french botanist who described the genus in 1805, guessed that he was beholding a botanical gem. But the time of awareness is nigh. In this digital and molecular age, inconspicuousness can no longer be an excuse for the lack of recognition suffered by this marvelous plant. It is time for the little Green Mountainlily to take it’s rightful place among the ranks of Tasmania’s iconic plants. Like the Delicate Laurel (Tetracarpaea tasmannica), we must sometimes know of the historical significance of such plants before we can truly appreciate their contribution to botanical heritage of this land we call Tasmania, a home to plant lineages of great antiquity. 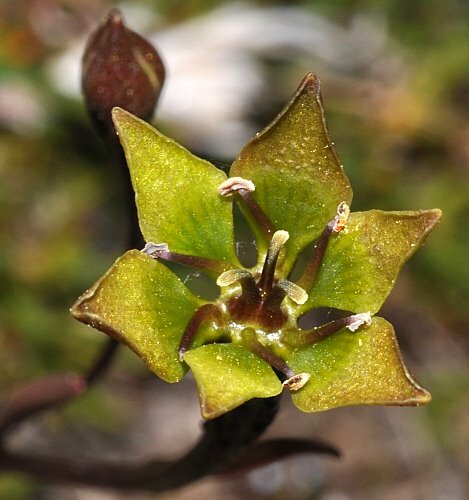 This entry was posted in Biogeography, Botanical Heritage, Botany, Plant Appreciation, Tasmanian Endemics and tagged Campynema lineare, Campynemataceae, central highlands, green mountain lily, green mountainlily, Liliaceae, Liliales, lily, monocots. Bookmark the permalink.